Sweet office. I fear an image that makes me want to change everything in my own space. Love it?? I love that pop of rich blue in that office (in the form of what appears to be an inspiration board), and the gold mug on the desk. However, I honestly like your office more. 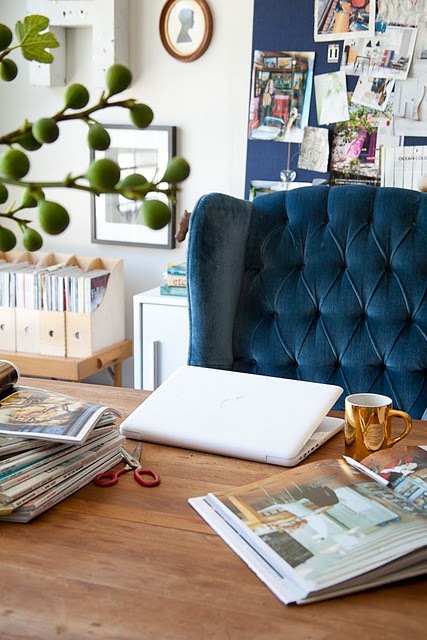 i'm all about that chair - color, material, style - love it - i want that chair in my office pronto! E! that blue chairs kills me. i love it. There is something about that chair that is so cozy and inviting!! I adore that blue chair! Oh looks so cosy and a really productive area. I think this is an office in which I would accomplish a lot! I do love it! Love, love, love it. I would steal that velvet chair in a second, if given the chance. Oh my goodness, having that chair in my office would completely change my life. I'm in love with that chair, inspired too! Love that chair! That would be a great space to get some work done! Oh yes I LOVE it! I know what you mean. I like what I have and then I see something else that is just amazing and want to redo everything! Lol! I could certainly live in that chair. Wish my office looked liked this. Love the blue chair. it is the chair that brings the design of this space together. I love how it looks a bit random, but all the elements have been carefully chosen! i don't love it, I adore it!!! ummm yeah that tufted chair is pretty fabulous! That rich blue color is so delish! Definitely feeling that gold mug. Yes, please.